In order to analyze computer games sufficiently, they first of all have to be described according to their mediality, understood as the very form in which possible contents are presented to be interacted with. This calls for a categorical approach that defines the condition of possible actions that are determined by the program, but that can only be perceived as aesthetic features. First-person shooter games thereby have to be conceived of as artifacts that, by means of visual presentation, provide a proof that computer games are a medium on their own. 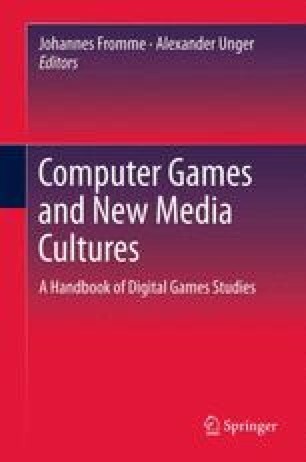 The thesis assumes that computer games are, first and foremost, pictorial objects, viz., images (The contribution’s results were developed within the DFG research project “On the Mediality of the Computer Game” at the Digital Games Research Center of the University of Potsdam). Juul, J. (1999). A clash between game and narrative. A thesis on computer games and interactive fiction. http://www.jesperjuul.net/thesis/AClashBetweenGameAndNarrative.pdf. Accessed 16 Dec 2010.